The Matan diamond gets its name from the Pangeran (ruler) of Matan, in whose territory in western Kalimantan (Borneo), the diamond was discovered in 1787, in the famous Landak mines, which was one of the oldest and most productive mines in the world. The diamond had remained in the Pangeran's family ever since it was discovered. The diamond has been preserved in its original rough form since its discovery. The uncut diamond weighed 367 carats, the largest gem-quality rough diamond ever discovered in Kalimantan, Indonesia. In the year 1787, the Matan diamond was also the second largest gem-quality rough diamond to be discovered in the world, after the 787-carat Great Mogul diamond, discovered in 1650. The size of the diamond was said to be equivalent to the size of a common walnut. The diamond had a bluish metallic luster. The diamonds from the Landak mines were particularly prized for their brilliance and variety of colors. From the description of the diamond it appears that in all probability the Matan diamond is a rare blue diamond like the Hope diamond. The color of the Hope diamond was also described by gemologists as a steel-like blue color. The Hope diamond which originally weighed 112 carats was first cut into a 67.50-carat triangular pear-shaped brilliant, and subsequently re-cut into 45.52-carat cushion antique brilliant. Presently the Hope diamond is the largest blue diamond in the world. Had the Matan diamond been processed into a faceted diamond, and allowing for an inevitable loss of 50 -60 % of the original rough weight, the diamond would have been transformed to a blue diamond of at least 120 carats in weight, which undoubtedly would have been the largest blue diamond in the world today. Perhaps the Matan diamond might be a colorless diamond that strongly fluoresces blue in light rich in ultra-violet rays like the Portuguese diamond and the Regent diamond. But this is highly improbable because a strong fluorescent effect is seen only in cut and polished diamonds. If the Matan diamond is a rare blue diamond, it must be a Type IIa diamond, in which the blue color is caused by boron atoms present in the crystal. The boron atoms also impart semi-conducting properties to these diamonds. However, the occurrence of these diamonds is less than 0.1 % of all naturally occurring diamonds. The Matan diamond was discovered in the year 1787 by a Dayak (aborigines) laborer in the Landak mines near the west coast of Borneo (Kalimantan). The town of Landak, the center of the rich mining district that produces gold, diamonds, and iron, lies to the northeast of Pontianak, the capital city of the West Kalimantan Province. 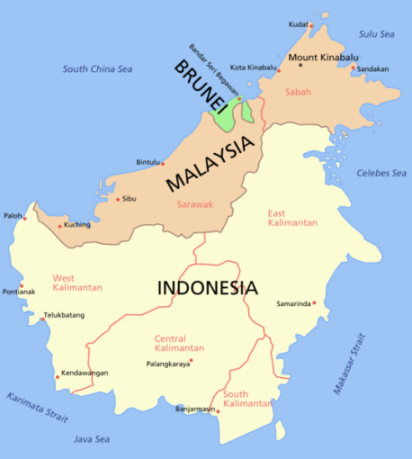 The district was situated within the domain of the Pangeran of Matan, and stretches along the west coast from Pontianak to Sarawak. It had been a Dutch Controlled territory for a long time. Diamonds in the Landak area are found in alluvial deposits of the Landak/Kapuas river drainage basin and the Banjarmasin drainage basin. 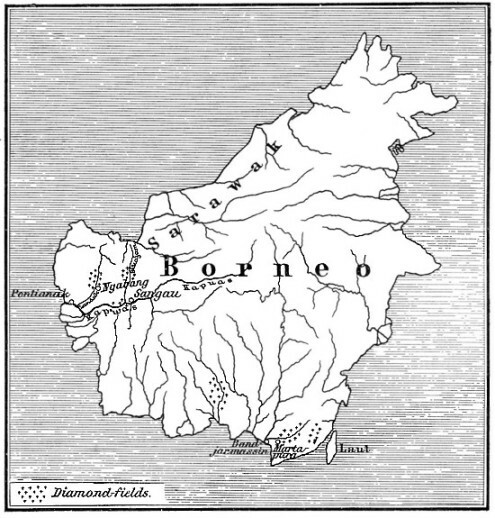 The primary source of these diamonds, the Kimberlite and Lamproite pipes must have been situated in the Gunung Niyut mountain range (1701m) and the Gunung Lawit and Pegunugang Muller mountain ranges (2240m) of western Kalimantan. But today no primary Kimberlite or Lamproite pipes have been found in these areas. This may be because of millions of years of erosion caused by heavy rainfall, which unearthed the diamonds and washed them downstream along the rivers and deposited them in the drainage basins. Thus today all diamond production in the region are from secondary alluvial deposits. Diggings in the alluvial deposits are about 5 to 10 meters deep. The trenches tend to get filled with water, which has to be pumped out from time to time using motorized pumps. Each pit is worked by about 10 to 20 workers. They use baskets to bring the sludge up, which is then poured into conical-shaped wooden bowls, and then swirled around for sometime, after water has been added. During this process the lighter material moves to the periphery of the bowl, and the heavier material, which may perhaps include a few diamonds, to the center. Having gone down to a depth of about 10 meters, the miners then work their way sideways, digging several horizontal tunnels. The steep vertical wall of the shaft are usually reinforced with wooden logs to prevent them from caving in. Mining activity in this area was usually carried out by the Chinese, but the actual mining operations were performed by the indigenous Dyaks or the aborigines, who were employed as laborers. It has been reported that the Chinese operators of these mines had treated the Dyak laborers with utmost cruelty and oppression, that led to a bloody revolt by the Dyaks in 1842, which ended up with the Chinese being driven out of the area or massacred. It is on record, that as far back as 1738, the Dutch who had been in control of this area, had exported 200.000 to 300,000 dollars worth of diamonds annually. The diamonds that were acquired by the Dutch East India Company were exported to the Netherlands, and helped lay the foundation for the development of Amsterdam as an international diamond cutting and trading center. It is also said that during this period few courts in Europe could boast of a more brilliant display of diamonds than the Royal Dutch Court. The Matan diamond which was discovered by a Dyak in the Landak mines in 1787, was claimed as a droit of royalty by the Sultan of the country, Gurn-Laya, who handed it over to the Pangeran (district ruler) of Landak. The Panjeran's brother took possession of the diamond and gave it as a bribe to the Sultan of Sukadana, in order that he might be placed on the throne of Landak. The lawful Prince fled to neighboring Bantam, and with the help of the Prince of that region and the Dutch, succeeded in regaining the possession of his district, as well as the valuable diamond. Since then the diamond had remained as an heir-loom in the family of the Pangeran. The stone is held in very high esteem in the family, and believed to possess miraculous healing powers. The people of Landak firmly believe that the water in which the Matan has been dipped is specific for all disorders. The diamond has also become a symbol of royalty, and the ruler of Matan has taken extra precautions to safeguard the diamond from his enemies, having once learnt his lesson by being robbed of his territory. It is said that the original diamond is kept under lock and key by the Pangeran, and visitors to his court are only shown a replica of the original if requested. Only a few visitors have had the privilege of seeing the actual diamond. It is reported that the Captain of an Indiaman was given the rare privilege of seeing the diamond, but was requested not to touch it. The gem was brought in, on a gold salver, and was about the size of a common walnut, with a bluish metallic luster. The Matan diamond thus became a symbol of sovereignty, a sort of talisman associated with power and the fortunes of the dynasty guarding it. The Koh-i-Noor diamond of India, assumed a similar status in its long journey through history, affecting many kingdoms and sultanates, until it was finally acquired by Queen Victoria in 1859. The Dutch were very keen in acquiring the Matan diamond, perhaps because of its great significance as a symbol of sovereignty in the minds of the ordinary Indonesians. Several tempting offers were made to the ruler of Matan, by the Dutch, but was always turned down. Perhaps in the mind of the ruler of Matan, the value of the diamond could not be estimated in material terms. Finally the Dutch, sent Mr. Stewart to the ruler of Matan, to negotiate its purchase. On behalf of the Dutch Govrnment, Mr. Stewart offered $ 150,000 in cash, two large war brigs, with their full compliment of guns and ammunition, besides a considerable quantity of other war-like material, but the tempting bait was rejected.